My first Second Life English course has finished, certificates handed out, the SLexperiments Wiki and group has been constantly growing since we started it and I have been exploring Second Life‘s potential for language teaching for a while now. Throughout this journey and as a member of the Webheads (an online community of practise), I have learned and experienced that sharing what one knows is a very powerful way of learning more. This and the fact that reflecting on one’s learning and teaching helps one to become a better teacher and learner were the reasons why I had decided to blog about my Second Life English course and publishing my lesson plans. I do hope there will be more feedback and comments on the lessons and my reflections so I and other teachers can benefit even more and improve our teaching. The logical next step is to give a public online presentation about this fascinating journey, my explorations and teaching experience. The presentation is mainly directed towards teachers but some of my students will (hopefully) also be present and learners wanting learn about new ways of improving their language skills or companies looking for effective and motivating language courses are most welcome to attend. The presentation will be on the WiziQ virtual classroom platform and is scheduled for Thursday, 28 August 2008 at 3pm GMT. Here is the link where you can sign up for the session. If you missed the live presentation, you can watch the recording here (you will have to sign up for Wiziq if you don’t have an account yet). Above, you can see the slides of the presentation. For the first time, I had no written lesson plan and wrote one after the class in order to upload it here. Which does not mean the lesson wasn’t planned. Dennis and I e-mailed about our plan and we also met before the lesson to make sure everything was set. I believe it is very important to give students a lesson overview so they know what to except. This helps them to relax and to mentally prepare to what is expecting them. It can also help weaker students to understand much better what is going on. Students went to Dennis’ website to find out who we were going to visit and to brainstorm some questions they would like to ask him based on the information on his website. Then we teleported to a place near Dennis’ home. I chose not to directly teleport in front of his house in order to make our visit look more “natural”. We had to walk over a bridge towards Dennis’ house where we had set up a fire place and the presentation screen and where Dennis was waiting to greet us. Sitting under the trees around the fire made such a difference to a more formal setting (classroom). This is one of the strengths of SL. Please, SL teachers, do not hold your classes in replicated RL classrooms. In SL, you can easily set the scene fitting the occasion. Isn’t this something we have often wished for in RL? Dennis did a wonderful job keeping his it informal and involving the students during the presentation by asking questions like “Who do you think this is?” “When do you think was this picture taken?”. His being an English teacher made my job easier. I joined my students and was part of the audience. As I didn’t have to do the talking, I could provide definitions in local chat of some of the words that Dennis used without interrupting the flow of the presentation or conversation. Writing a letter to Dennis to either thank him, ask for clarifications about what he said, comment on his presentation or the visit or anything else they want to write. In the first stage, I wouldn’t only ask students to read the information on the website and brainstorm questions but also to make predictions about the guest, depending on what information is already available (e.g “Why do you think did he travel so much?”, “Do you think he liked his job?”). This would give them a focus when listening to and watching the presentation and more things to ask about. Next time, I would keep the presentation a bit shorter and give students more time at the end to chat with the guest. Having a guest added more variety to the course and gave students a chance to listen to someone with a different accent. This is definitely something I will try to include in all my courses. 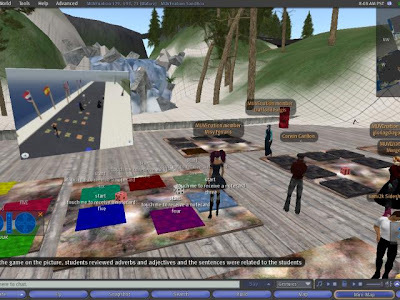 Second Life and online teaching makes inviting guests from diverse backgrounds and countries much easier than Real Life and one should take advantage of this. Click here to read Dennis’ reflections on the lesson. First time that I actually left out a major stage.There were only two students attending the class for the first half hour. Which was not good for my lesson plan but on the other hand, I could voice chat with them and we could take our time. They are my weakest students and it was the first time that one of them had said so much in voice. So, it was worth the time. I did the review with the two of them and when I started the news topic some more students arrived. Another reason for “losing” time was that the homework presentation took longer than I had expected (see below). In order to review the shape names, I was naming objects and asking students what shape that object was. One of the things I said was “donut” but both students didn’t know what it was. So, I quickly opened my browser and searched for pictures. Within seconds I had found several and students could give me the correct answer. This a huge advantage of online teaching and learning. In this lesson we had to teleport several times to different locations. There were no problems and no time was lost. In a Real Life class it would have cost a lot of precious class time. This and the fact that one can simply teleport from the classroom to Reuters’ bureau, back to the classroom, over to the sandbox is amazing and can make lessons so much more interesting. Students in SL love to visit different places and love to move, walk and fly and do things. In this lesson, they had to explore the Reuters building after we had established the fact that it was a news agency. We all had fun, especially when we discovered a picture of a veiled lady (see pictures) that looked like one of my students 🙂 We sat together in the lounge and talked about what they had found. Then we discussed what journalists do and the qualities and characteristics they (should) have and the students came up with some great vocabulary. We looked at a picture of a row of photographers and students commented on how they would feel being the person photographed. Then, we played the “Hot Seat” game. In order to decide in which order they would sit on the hot seat, they had to find out when everybody’s avatar was born in SL and line up accordingly. The students loved this game and asked many questions. The girls, who are RL friends and study at the same university, were more daring when interviewing each other. This was great practise for asking questions. I corrected immediately but only in local chat without interrupting the flow of the activity. This is another great feature in SL. In RL I would have to either interrupt students and correct or opt for delayed feedback after the activity. In SL I can correct in local chat if it concerns the whole class or I can IM (instant message) a student and correct discreetly. Another advantage is that the chat log is recorded for everybody to see what they have said and for me to analyse later and use for future lesson planning or for individual and class feedback on the course website. This time most students had done their homework. I was expecting simple objects with a script but I was surprised and amazed with what they had built. You cannot see it on the pictures but the transparent shapes on the built with the checkered floor and the chairs arranged in a circle actually rotated. The ice-cream cone was another lovely idea to use a shape and an object that is named after it. Students did probably not use much English while building their objects but they had fun and they had to talk about their objects when presenting them. The most complicated built was by one of the weakest students and it was important for him to get praise for his work. Be flexible and skip or add activities when needed. 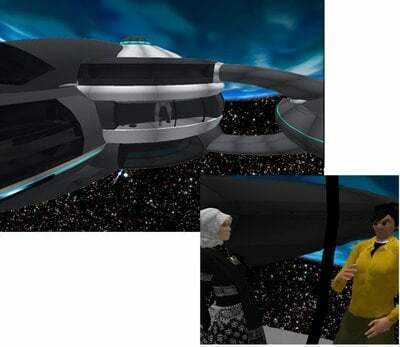 Use Second Life’s strengths fully instead of thinking of its limitations. Most limitations only exist when we think of RL classroom activities and want to transfer them to SL. Give your students control and let them teach you something they know better (e.g. building). Most say they learned a lot of new words in this lesson and practised speaking enough (one says “a lot”). For most the lesson was at the right level of difficulty except for one who found it too difficult. All students liked all activities in this lesson. What they liked most was the Hot Seat game and visiting Reuters. For this lesson I needed a location where all participants had permission to rez/build objects. I did, however, not want to go to a public sandbox as we would be using voice and I didn’t want to disturb others or wanted to be disturbed. In a crowded place it is difficult to mute everybody except the class members and group call (in IM) can be problematic. I decided to hold the class in front of my house on the SL English SIM. In order to be able to build students had to become members of the SL English group. It took at least ten minutes until everybody was enrolled because some students did not know how to join a group. In order to avoid such a waste of time and hassle in the future, it is a good idea to arrange this in advance (e.g. by sending students a group notice telling them to join the group and explaining how to do this). Alternatively, I could find land that allows everybody to build on and which is usually not crowded at the time of the lesson. Most students new how to create simple objects like cubes and pyramids. This was good because I did not have to explain how to create them and could concentrate on eliciting or introducing the names of the shapes. This part of the lesson worked out quite well but because we were late and I didn’t want to skip any of the later steps, I didn’t introduce all shape names. Later I realized I had completely forgotten to introduce the adjectives. These were, however, in the list I gave everybody at the end and they are also on the course site together with my recording of the pronunciation. Instructions and prepositions of location. Students had to follow my instructions and build objects in the shape and colour I told them. Then, I described an object and students had to walk to where it was. Finally, I and then other students instructed the others to move their objects to particular places to practise shape names as well as prepositions of location. All, of this worked out fine, except that, sometimes, it took a while until we could see all rezzed objects. I had the feeling that the students were not all too motivated in these stages or maybe they had to concentrate so much that they didn’t have time to say or type much. None of the students had build a scripted object before so they were all very motivated in this stage. There wasn’t enough time to send students to the website where they could create their own script so I placed a sound and a script (play sound) into an object that gives all its content to anybody who touches it. This was time-saving because I didn’t have to pass around these items. This was a truly interactive task and all students had successfully built their objects that played a sound when touched. They were free to choose any shape and texture to make it more individual and give them choice. This activity would have been even better by giving students the change to select and/or produce their own script and select the content of their object (notecard, LM, sound, etc.). One little problem was that it was difficult to test the objects because all had the same sound. But we managed to do that and I was also able to see where they had problems when building as I could look into their objects and see whether they were doing the write thing. We had five minutes for this and I rushed through it a bit. Students said they all like building in SL and one student showed us what he had built. This is a very handy object, which I used several times in this lesson. As I described above, you can fill it with inventory items that you want to hand out to everybody and by touching it students are given its content. Very time-saving and extremely easy to set up and use. Besides reviewing the vocabulary, students have the optional homework to build an object which they can show off next time. I am curious what they will come up with. I’ve added some videos about how to record and upload their own sounds and about scripting to the Moodle course site to help them with this task. There are two limitations to take into consideration here. Uploading sounds cost L$10 each and they must be shorter than 10 seconds. There was not enough speaking practice for the students in this lesson and it was very teacher-centred. Whether this is something negative, I am not sure. During the lesson I had the feeling that it wasn’t good. It was also in stark contrast to the lesson before this one. I do think, however, that we should not always shy away from teacher-centred lessons or too much teacher talking time as long as this is the exception and not the norm and it can be justified. I am not completely happy with how this lesson went (transition problems, level a bit too low as I didn’t introduce enough new words) and maybe I need to change the lesson plan a bit and think more about some of the stages. But I think in general this is the kind of lesson that uses the strength of Second Life. Students learn skills besides learning English (content-based) and students actually produce something.